It is well-known that Henry VIII loved women. Especially ones that could potentially give him a male heir. After the execution of wife number five, Katheryn Howard, Henry was once again on the hunt for a new wife. As King of England he would surely have been a great catch to any woman. He was all-powerful as King of England, Ireland and France, as well as being the head of the Church of England. Becoming his wife would mean you nearly had the world at your disposal. The downside, of course, was the fact you had to be intimate with him. 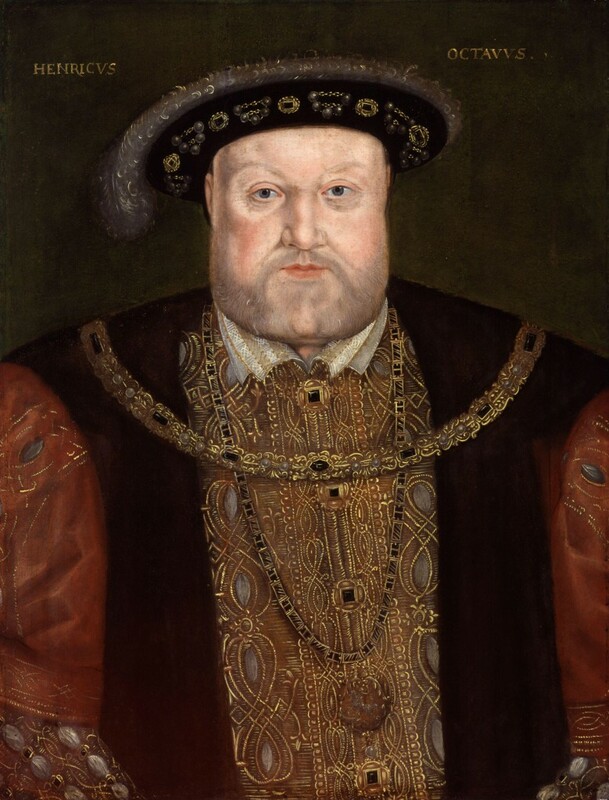 I was not present in Tudor England, but I can make assumptions from everything I’ve read over the years and believe that any woman would have been repulsed by the obese king with a rotting leg. 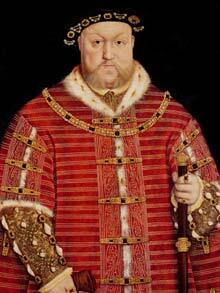 But, with that being said, it was impossible to say no to the king…especially Henry VIII. 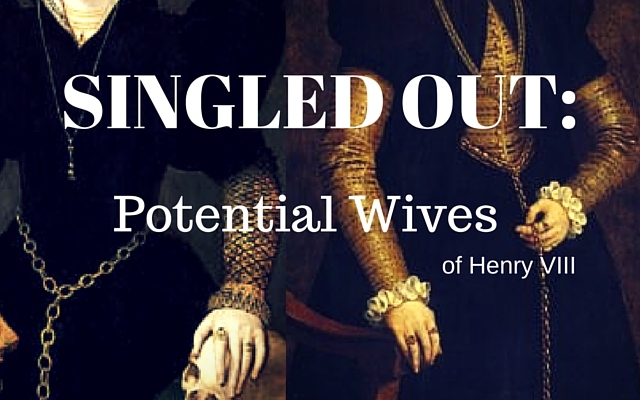 There were a few women who were singled out as potential candidates for Henry’s sixth wife. As we are aware, his ultimate choice was Katherine Parr, but who were the other contenders and what do we know about them? The lady for whom he showed the greater predilection on the occasion was no other than the sister of Monsieur Coban (Cobham) the same lady whom Master Huyet (Whyatt) did some time ago repudiate on a charge of adultery. She is a pretty young creature, and has sense enough to do as the others have done should she consider it worth her while. (fn. n2) It is also rumoured that the King has taken a fancy for the daughter of Madame Albart, the niece of the grand esquire Master Antoine Brown, and likewise for a daughter by the first marriage of the wife of Monsieur de Lyt (Lord Lisle), once debitis of Calais. Indeed my impression is that unless Parliament entreats him to take another wife, he will not be in a hurry to marry; besides that there are few, if any, ladies at Court now-a-days likely to aspire to the honor of becoming one of the King’s wives, or to desire that the choice should fall on them; for a law has just passed in Parliament enjoining that should the King or his successors wish to marry a subject of theirs, the lady chosen will be bound to declare, under pain of death, if any charge of misconduct can be brought against her. Many here think that in the midst of all this feasting and carousing the King may well take a fancy to some lady of the court and marry her, but I must say that at present I see no appearance of that. 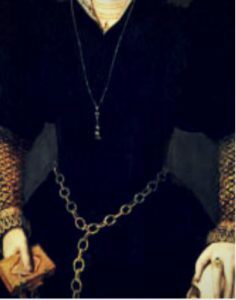 Anne Bassett, born circa 1520, was the daughter of Sir John Bassett and Honor Grenville. Sir John died when Anne was young and her mother married a second time to Arthur Plantagenet, illegitimate son of King Edward IV. They later became Lord and Lady Lisle and resided in Calais. Lady Lisle had huge ambitions for herself and her children — marrying an illegitimate son of a late king wasn’t a bad choice for her, and it certainly brought some recognition. Arthur was a Plantagenet, but he was illegitimate so he wasn’t a huge threat to the Tudors. When Anne’s mother moved to Calais to be near her husband, she sent her daughters Anne and Mary Bassett off to school in France to improve their French. Since Calais was an English territory the girls needed to travel further into the country to learn the native language. Anne was sent to live with madame and monsieur de Ryon at Pont de Remy, while Mary was sent to live with monsieur and madame de Bours at Abbeville. Surely both girls behaved very similar to Anne Boleyn with the French influence they had obtained during their time living there. Anne eventually served Jane Seymour near the end of her reign after her mother convinced the queen. Between 1538 and 1542, Anne was rumored as a mistress to Henry VIII and a potential fourth wife (in place of Anne of Cleves) in 1540 and then again as a sixth wife after the downfall of Katheryn Howard in 1542. 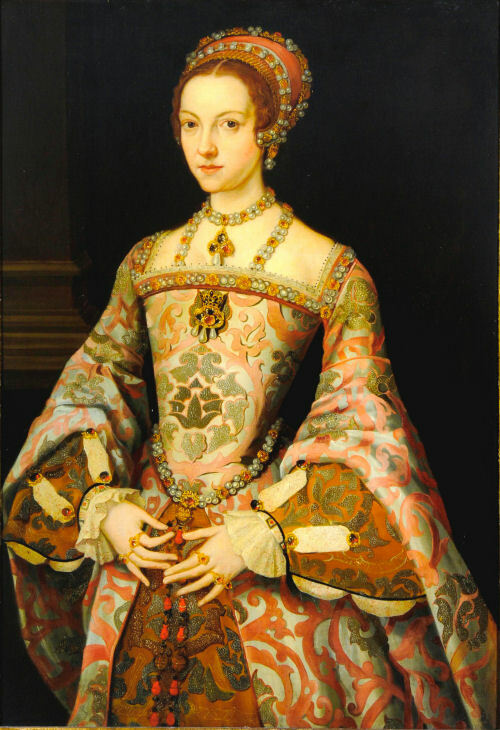 Anne was merely 18 years old in 1538…Henry, not long after considering Anne, married the very young Katheryn Howard. As referenced above, the sister to Lord Cobham was also singled out by Henry VIII. Elisabeth Brooke (b. 1526) was the eldest daughter of George Brooke, 9th Baron Cobham (of Kent) and his wife Anne. 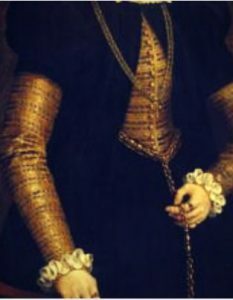 Elisabeth was the niece of Sir Thomas Wyatt and his wife Elizabeth Brooke. Wyatt had been estranged from his wife for over fifteen years on accusations of adultery, on her part. However, we already know that Wyatt was indeed an adulterer because it was common knowledge that he had continually laid with Elizabeth Darrell. It seems that the Elizabeth was indeed an adulteress because her father completely ignored her in his will and favored Wyatt over her. The younger Elisabeth was described as vivacious, kind and one of the most beautiful women at court. It had been thought by Eustace Chapuys that Henry VIII considered Elizabeth Brooke (wife of Thomas Wyatt) as his 6th wife, however she had been accused of adultery and Henry just lost his fifth wife to that charge. Plus she was around 40 years old. Chapyuys must have confused her with her young niece, Elisabeth Brooke. During this time in history it was clearly frowned upon, if not forbidden to divorce your spouse — you could not marry again until one spouse died. Wyatt effectively disowned his wife and forbade to see her again. This is another reason why she was most likely the wrong woman discussed in the letter by Chapuys because she was still married. Lucy was mentioned in a letter by Imperial Ambassador Eustace Chapuys to his master Charles V, Holy Roman Emperor as having been one of the three ladies in whom the King was showing a marked interest and was considering for his sixth wife. The previous statement was on the wikipedia page for Lady Lucy Somerset, however, there is no source linking to the article. I was unable to find the letter. ← Quiz: Who’s Who at Tudor Court? Ladies of King Henry VIII court were certainly in a predicament if they caught Henry’s eye.